Ever the planner, I made two dinner reservations in Montreal months before our trip. I know, I'm a nut, but I felt like Montreal was the city where we'd indulge in a couple of haute cuisine excursions. The first was one I'd read about, Le Club Chasse et Pêche. The name means hunting and fishing club, and it was located in Old Montreal, with a very understated entrance. Once we entered, it was like we were members of a secret club! We really enjoyed pairing drinks with courses during these dinners out, and this place didn't disappoint. Totally contemplated walking off with a glass, but it wouldn't be classy. We started with the braised piglet risotto, topped with foie gras shavings. It's one of their signature dishes, but quite heavy, so we split it. Decadent is the word I would use to describe it. Dan chose the Chasse et Peche dish, which is one of their specials. That night it was steak and lobster claw, his version of heaven. It was one of his favorite meals of our entire week in Quebec. For me, I chose the other special that changes all the time, the "Hot and Solid" meal, which pretty much describes my favorite type of meal, right? That night, it was veal with mushrooms and potatoes. It was marvelous, and it looked like art. I had to kind of get over my thoughts about veal (having just eaten piglet risotto kind of made me feel like the baby animal seal was already broken that night, and foie gras has its naysayers too) and just savor it all. Yum. I can't lie, it was delish. And yes, we got dessert, because vacation. But we split this tiny little log of goodness. I think it was their praline tile, but I can't be too sure. By the end of multi-course meals with loads of wine, I'm too tipsy to be a good blogger and remember everything. 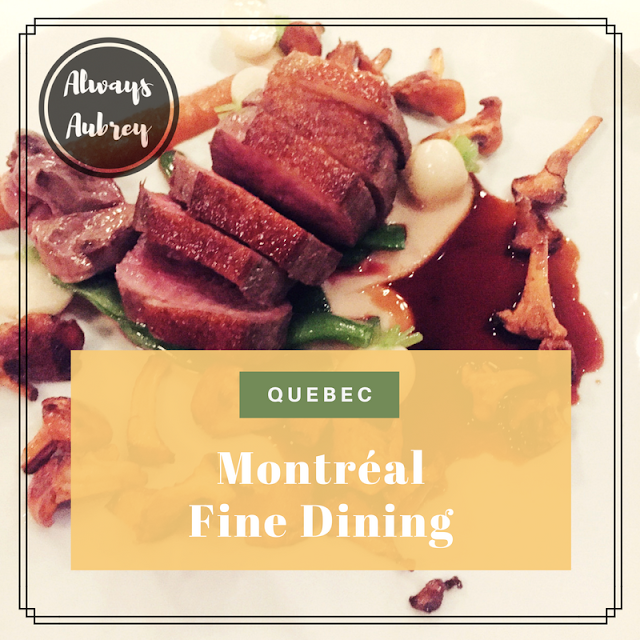 The other haute cuisine dinner indulgence we made was Toqué!, consistently named one of the best restaurants in Montreal. I'd eaten there on a trip about eight years ago, and I was excited to be back! We decided against the famous tasting menu, having indulged so much during our trip, but our server was absolutely fantastic. He even helped pair half-glasses of wine with each course that I had, which was perfection. I started with a champagne tasting, just to get going. Then he paired a white wine with my foie gras starter, with apple purée, shiitake mushrooms, and buckwheat crumble; it was so rich I couldn't even finish it. It was seriously too much! 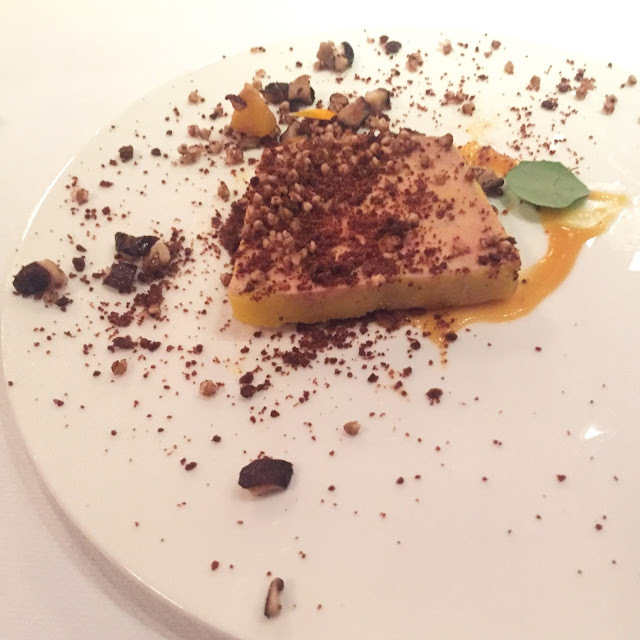 I pretty much never eat foie gras, but I felt like I was in France and had to indulge. Dan's dinner was a lamb dish, and it was beautifully plated! He enjoyed it, especially all of the mushrooms used in so many of the dishes. I had the duck magret, with hedgehog mushrooms, carrots, Tokyo turnip, borlotti bean purée, Madeira sauce. Duck is another indulgent thing I don't get to eat very often. This one was absolutely beautiful too. Delicious! For dessert, we had Peruvian chocolate dish with sorbet. It's rotated off the menu, but I loved how it looked like bark with plants growing from it. They do a good job with molecular gastronomy at Toqué! It was really an incredible meal. So yeah, I gained a few pounds during our trip to Quebec. Montreal is an impressive food town, and I feel like we got to taste both the high-end and cheap delight ends of the spectrum, and tons in between. You really shouldn't have a bad meal in Quebec, because there's so much good to find. We loved using Yelp to find good spots, and it didn't steer us wrong. How do you indulge on vacation?